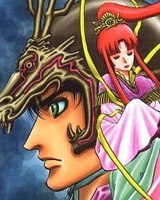 Plot Summary: The continuation of Shiro Amachi's journey in the Three Kingdoms era brought him to the Kingdom of Wei, Cao Cao's kingdom and he strives to repel the advances of Wu under the leadership of Zhou Yu. Shiro was given an elite army of his own by Cao Cao and with helps from familiar faces such as Lian Hua, Zhang Liao, and the Fledging Phoenix, Shiro continues to become the focal role in maintaining the balance in the Three Kingdoms era as he faces the threat of the bringer of chaos Chung Ta and his five Tiger Generals who threatens the balance of Three Kingdoms era. And so, his legend: the legend of the Son of the Dragon, continues.